This is the final post of a four-part series based on the WSJ-D.Live event where I look at how culture has an impact on product and brand affinity. Brand relevancy and enjoyment was a theme that was brought up by Reed Hastings, Shane Smith, and Satya Nadella. They highlighted this as important to their companies moving forwards and emphasized how having the right culture plays a huge role in delivering this. Satya Nadella also talked about culture, saying ‘culture fights the creation of new products’. This was one of the problems that Microsoft faced when it was trying to evolve. From the way he spoke, it was apparent how important cultural change is to him in fuelling the company. I have tried to get much more focused on the sense of purpose and identity of Microsoft. We were a tools company. We were built for the hackers of the world, for the makers of the world, for the builders of the world. I have always felt that we are at our best when we express that identity with changing times. It’s about being in love with Minecraft. It’s being in love with what’s happening in AI and democratizing it. You can see the impact of AI through this lens of augmenting human capability, human enjoyment, human creativity. That’s the lens through which we’ll look at it. This idea that culture (the way teams work) is instrumental in the delivery of products is something we firmly believe in, from experience, at Beyond. With technology moving at such speed business is experiencing disruption both on an organizational and a product level. Without the right framework and design at either scale, companies won’t be effective in today’s world. Reed Hastings also talked about how he measures success in terms of joy multiples and joy creation as he looks to extend the brand outside of the US. 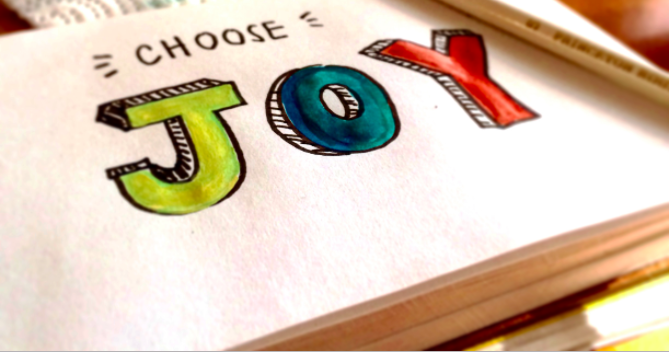 His finance guy calls it “F’n Joy” – the efficiency of joy creation. Similarly, John Maeda of Automattic expressed the importance of design and design thinking in software products. There is a big opportunity in enterprise software as it is traditionally so badly designed. His research in tech design leaders, rates Google as currently being the best in its use of design in the tech space and attributes this to getting culture right. He also believes Microsoft is on the rise here. Maeda also raised the issue of inclusion in design. It is imperative, in his opinion, to take into account a diverse user base when designing products. He believes people are inherently lazy and this is evident in the lack of acknowledgment of diversity in design. He quantified this point by using Snapchat as an example. The media sharing platform has exploded, bolstered by its acquisition of facial mapping company Looksery to power their animated selfie lenses – but these filters are not designed with every user in mind. Snapchat has come under intense public scrutiny as there have been instances of the filters failing to recognize faces of various ethnicities. This is an issue of inclusion – one that could have been avoided by approaching design through the lens of diversity and conducting rigorous user testing with this mindset. Another key insight from John Maeda which is interesting to our profession is that designers traditionally stumble in their failure to talk about business impact and, as such, the C-level don’t see the importance of design. To combat this, we need to refer to design as the experience and not the artifact. To back up the growing importance of experience design in technology he referenced to research from KPCB, the VC firm where he worked previously, as reference. 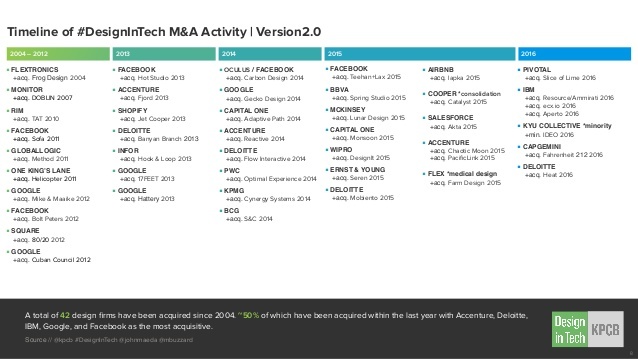 In its 2016 report, it notes that 42 design companies have been acquired since 2002 but that 50% have come in the last year with IBM, Facebook, Google, Deloitte and Accenture being the most acquisitive. It’s clear that once you design a strong culture, product joy will follow. Experience is key, both within the workforce and in the products you create.